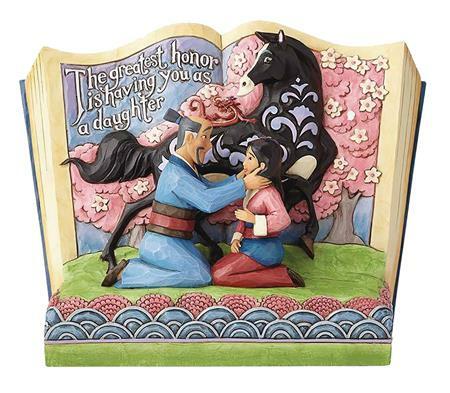 The 'Mulan Storybook' from the Disney Traditions by Jim Shore line features characters from Disney's Mulan reimagined in the style of handcrafted folk art. This figurine captures Mulan, Fa Zhou, Mushu, and Khan in beautiful detail, with accurate features sculpted in hand-painted stone resin. Stands 7 3/4' tall.